Looking at the OSD, the 2408WFP again follows in the footsteps of the 2407WFP. It comes with seven color presets, which can be further modified by selecting "graphics" or "video". PC and Mac gamma settings are also available. 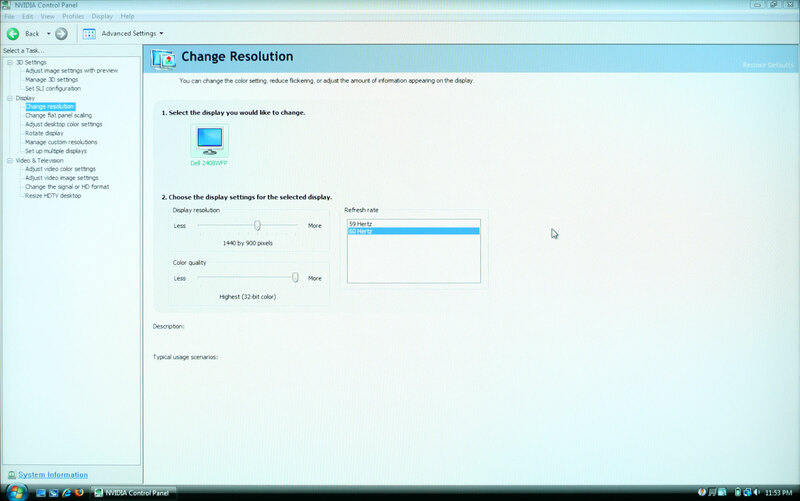 Picture-in-picture (PIP) is also available, provided one of the inputs is an analog connection. Most of the tested resolutions more or less work properly on any of the three main computer inputs. VGA mode performs flawlessly, while on DVI and HDMI inputs some of the widescreen resolutions require you to manually select "Fill". If you want a 1:1 image, a few resolutions have problems on DVI and most of the lower widescreen resolutions fail to work in this mode. As with all LCDs, there's an "auto adjust" function that executes when you change resolutions while using an analog input (i.e. VGA). This function works as expected and takes a couple seconds to execute; it apparently remembers the last 10 resolutions you've used; otherwise, the auto adjustment runs again. Component input is rather disappointing, as 720P and 1080I both have ~10% overscan; using a PC, you can output 1176x664 or 1768x992 to avoid this, but if you're using a computer you will probably want to use one of the other input options. Even then you still end up with a black bar on the right. The 30Hz HDMI modes all overscan as well (1280x720, 1400x1040, 1440x900, 1680x1050, and 1920x1080) and show scaling/de-interlacing artifacts; in other words, don't use them if you can avoid it. Overall, 1080I seems better than 720P on the component video connection, so if you plan to connect the LCD up to a component video source, we would run 1080I. As you can see in the above image, scaling artifacts from over resolutions are not a serious problem. Running at the native resolution is definitely preferred, but if you happen to run a game at a lower resolution you should be fine. Connecting a gaming console to any of the inputs should also work well, but keep in mind the aspect ratio comments from above. 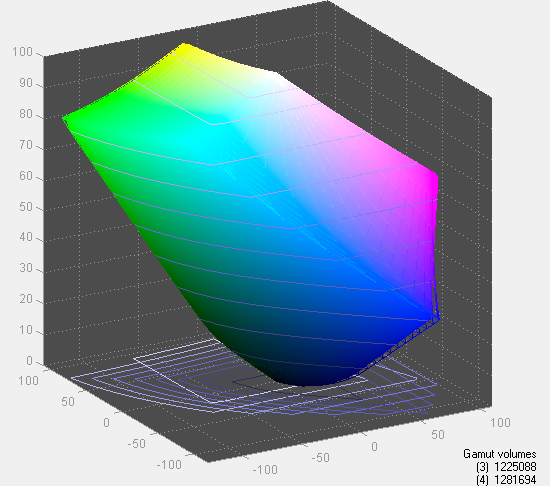 Taking a quick look at color accuracy and gamut, the overall color accuracy is exceptional. If you look at the above results, you might not believe that we were able to achieve a Delta E of only 1.7 without calibration! 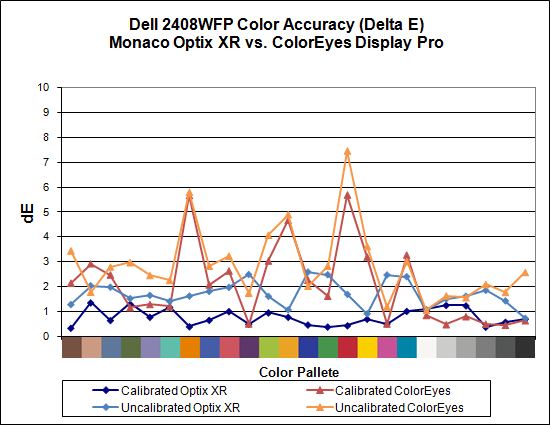 Yes, that's right: without hardware calibration, the Dell 2408WFP can surpass many other LCDs with hardware calibration. Just to be clear, we set the brightness and contrast to 50, selected the custom color profile, and dropped the RGB settings to 80; otherwise, the default settings tend to be quite bright. After calibration, scores further improve to an extremely low 0.78 average. The highest Delta E after calibration is only 1.31. Color gamut is also exceptional, and this is the only display we've tested so far that achieves better than 100% of the Adobe RGB 1998 standard. Simply put the colors and color accuracy of the Dell 2408WFP absolutely blew us away. If you're an imaging professional and you're using Windows (we have heard there can be some issues with high gamut LCDs under Mac OS X, particularly with the Safari web browser), this is the best LCD we've tested so far. Perhaps more surprising is the fact that you can pick it up for only $600 (at least with the current sale -- MSRP is usually $700). Top that off with a 3-year manufacturer warranty and you've got a delicious LCD soup ready to serve up. The only fly in the ointment is the aforementioned input lag, which could present problems if your primary computer applications or games and your reflexes are so honed that you can notice the ~30ms lag. If that's the case, you'll probably need to compromise on image quality and pick up a TN panel LCD. Any chance of a 30" monitor roundup for those of us wanting to buy an extreme HD monitor to go along with the new high end gaming computer we're buying around Christmas time? Am I missing any 30" monitors currently available? Which is the best, regardless of price? Which is the best in terms of bang-for-the-buck? Which is "future-proof", with good connectivity? I plan to use it to play Starcraft II and Warcraft III and maybe some Everqeust. I just turned 40, so as part of my mid-life crisis, I'm buying a high end gaming computer, probably a CyberPower Black Mamba or a Digital Storm of some kind, depending on how the stock market does. Basically an overclocked Core i7 with three-way or quad SLI. My computer budget is $4000 to $6000, not including monitor price, and I can get a nicely configured Cyberpower for about $5400 last I checked. But what to use to display all that computer goodness? I figure to spend $1000 to $2000 on a 30" monitor, but which one?!? First of all a big thank you for these reviews - they are top notch. I'm currently trying to decise between the Samsung and the Dell. I'm not into gaming, so latency doesn't bother me. Nor for that matter do the plethora of inputs both provide - I'll just be using with the one DVI input at native resolution. Living in PAL country, I would be delighted if either of these monitors do 50Hz FR. I doubt it very much, but thought it worth asking. I know that my large Samsung 405T wasn't specified at 50Hz, but it is able to do it natively nevertheless which makes for judder free PAL DVD and FTA TV program watching on the screen. So, apart from this probably undefined/untested aspect, which would be the better choice, given as I say that I am not interested in gaming? I bring this comparison up here as this review does not list the Samsung in its comparison table. The Dell was the editor's choice, but the Samsung was reviewed after this 24in line up, so I was wondering if it could be included somewhere in the ranking? Thansk again for the tremendous effort that goes into the testing and reporting. As I can't edit my previous post, just a correction wrt the timing of the 2 reviews. I can't find reviews anywhere of Eizo LCD monitors. Eizo has a great reputation, but that's all I seem to be able to go on. A salesman gave me a really good pitch for the Eizo FlexScan S2401W. It's a Samsung TN panel (he claims), but somehow being an Eizo it's much better for color quality than any Samsung in the price range. It seems to be a good candidate for balancing accurate color and minimum input lag. But I can't be sure, since I can't test it in the shop for any of those things, plus the shops where I live are all little cubby holes in computer centers, with minimum choice in each shop, so it's impossible to do any side-by-side comparisons between Eizo, Samsung, NEC, etc., since they're never together in the same place. Today I bought a Samsung 2693HM for $600 - $50 rebate and I am blown away. It looks great - very bright and vibrant. I am wondering if it has the same low input lag as the 2493HM. The resolution is 1920x1200 so at 25.5" it's got bigger pixels which is just fine for my poor tired eyes. Can someone help me with a recommendation? After reading billions of reviews of monitors I am confused as hell? is there a "best compromise" LCD monitor for both color accuracy and least lag time? I am not a gamer. I am an animation professional, and I heavily use Wacom tablets for drawing, loose and freehand, with Photoshop, Flash, and various professional animation programs. I've always used a CRT monitor and never once have experienced any lag between my stylus movement and lines on screen. I do own a Compaq tablet PC, and when I draw on-screen, the lag is perceptible enough to make the drawing very unnatural and inhibited. I just can't draw freehand that way. As my beloved, expensive flat screen Samsung CRT monitor is now dying after 7 years of heavy use, I'm in the market for an LCD. In my business I need both excellent color accuracy and zero or minimal lag time for stylus input. Where I live (Hong Kong) there isn't a single shop that would ever allow me to test such a setup, so it's a lottery for me. Plus, their in-store demonstrations for color "accuracy" are geared for Asian tastes, which is heavy HEAVY on oversaturated red (while westerners prefer oversaturated green). After poring through all the reviews, particularly on this site, I can't even narrow down the choices to 4 or 5 candidates. The Dell 2408 looks amazing except for lag time. The Samsung XL20 (not widescreen, but I don't really care) looks great for color and no lag time, but it has a noisy fan (irritating!) and is a bit smaller than I want. Surely you know someone over there that can let you borrow an LCD to test out? Honestly, I don't think you'll experience problems with input lag - we're talking about 50ms or so relative to a CRT, so 1/20 of a second. What you've noticed on a tablet PC probably has a lot more to do with the lack of processing power and other differences. All you really need to do is find someone with an S-PVA 24" LCD and you can see if you notice lag. I can game fine on the 2408WFP - the lag is just barely perceptible at times, but not enough to cause me problems. But I'm not a competitive gamer. As for DoubleSight, their 26" LCD is about to be phased out apparently - I asked them for a review sample and they said it was at EOL. It may become even more difficult to find in stock shortly. Actually, I don't know anyone with an LCD screen to borrow, other than my son's cheap one which is fine for gaming but not even close to being color accurate, so not exactly a good example. I can tell you that I tried a Wacom Cintiq tablet, which is essentially an LCD screen you can draw on. It was connected to a G5 Mac, so no lack of processing power. The lag on that was a fraction of a fraction of a second. But I kept finding my hand slowing down to let the line catch up to the stylus, which sucked all the spontaneity out of my drawing. In other words, for a "sensitive artist", even a small lag is noticeable. With the Cintiq I attribute it to the signal having to travel round trip on a USB connection. But I am now quite concerned about buying the wrong LCD and being stuck with it. This isn't the USA. Once you buy something and leave the shop, there is no such thing as returning it.